Chances are that hundreds of species of moths live just outside your door. Moths show an amazing variety of color, shape, and behavior, but since most (though by no means all) of them are active at night, we often simply overlook them. In Discovering Moths, John Himmelman opens our eyes, showing how moths are every bit as fascinating as the birds and butterflies that brighten our daylight hours. In lively, accessible prose, he explains moths' intricate life cycle, their importance in nature, and how just a handful of the world's moth species are truly pests to humans. 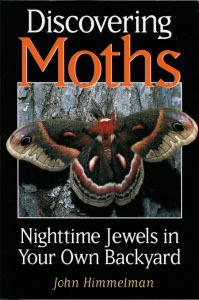 He tells how to attract moths with lights and sugar bait, when and where to observe them, how to raise them, and even how to photograph these tiny subjects. 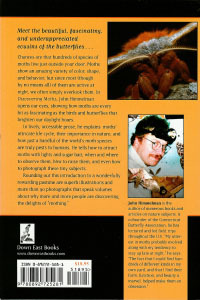 Rounding out this introduction to a wonderfully rewarding pastime are superb illustrations and more than 90 photographs that speak volumes about why more and more people are discovering the delights of "mothing"
John Himmelman is the author of numerous books and articles on nature subjects. A cofounder of the Connecticut Butterfly Association, he has lectured and led field trips throughout the US. "My interest in moths probably evolved along with my tendency to stay up at night," he says. "The fact that I could find hundreds of different kinds in my own yard, and that I find their form, function, and beauty a marvel, helped make them an obsession." Sample pages - Click for larger image.